Buxton Heating have a number of years experience servicing, repairing and installing boilers in residential properties. We have helped a number of clients in Midhurst with their central heating needs. Our team understand that it is not always easy to choose the right option for your property, and will be able to advise you on the best approach to ensure an efficient central heating system in your home. If you are interested in finding out more about our services then please feel free to contact our team who will be happy to offer you professional advice, allowing you to make a better informed decision on the best solution. Your boiler is an integral part of your home. It is responsible for powering your central heating system and keeping your home warm. This means it is vitally important to choose the right boiler for your property. Buxton Heating’s team of engineers have many years experience installing a range of boilers and will be able to efficiently install whatever boiler solution is best for you. The fact that our engineers are Worcester Bosch boiler accredited installers is proof of the reliable service we provide to our clients. Boiler servicing may not be seen as a necessity by homeowners, but there are plenty of reasons why it should be. Regular servicing of your boiler can ensure that is is operating efficiently and safely. Any faults can be identified and rectified, to make sure that your boiler provides many years of reliability. 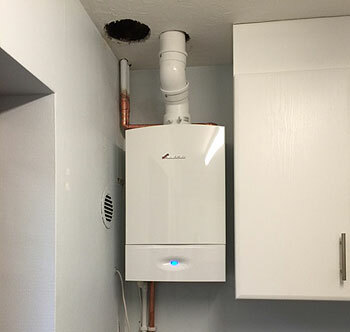 Our boiler servicing team will carefully inspect your boilers operation and carry out a flue test, which will identify if any harmful emissions are being produced. Make sure your boiler is operating effectively with boiler servicing from Buxton Heating. Boilers can suffer from faults and when this happens it is important that you get your boiler back up and running as quickly as possible. Our boiler repair team have many years experience working on a range of domestic boilers. They will be able to respond and resolve the fault, so your boiler is back working quickly. If you have any issues with your boiler then contact our team who will be happy to identify the problem and offer the best possible solution.